The Non-Skid Wrist Cushion offers all of the same benefits as the original, with the added benefit of a non-skid bottom to keep it in place. The ergoBeads filled wrist cushion offers a comfortable support for your wrist while typing. 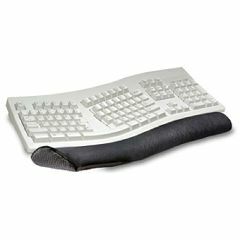 The unique design conforms to your keyboard, while completely supporting your wrist and forearm in an ergonomically correct position. The ergoBeads massage your wrist as you type, providing all day typing comfort. I use this everyday at work and it's wonderful. When it's not in functional use I find it very soothing to knead it with my hands, sort of like a stress ball, but better.